Watch our new video documentary about Britt Dental Center!! A special thank you to James Johnson (www.gonarrowmedia.com) for doing such an amazing job in capturing who we are and what we are all about. 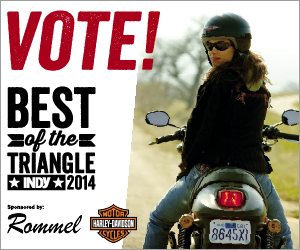 Vote for Ben H. Britt, Jr., DDS, PA for Independent Weekly’s Best in the Triangle 2014!! Click here to take the survey now!! Britt Dental was a finalist in Indy’s Best of the Triangle 2011 and 2013, let’s make this our year to be voted the BEST!! Now Offering Six Month Smiles®!